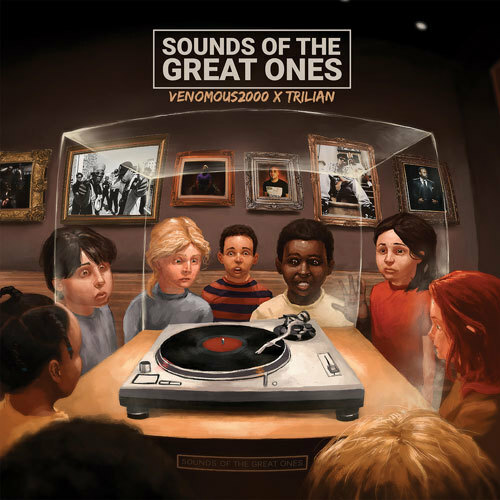 Prolific underground spitter Venomous2000, heralding from New Jersey, links up with Serbian beatsmith Trilian for the fantastic full length LP entitled ‘Sounds Of The Great Ones’. Dope rhymes, classic beats and a feature-list that is both extensive and impressive mean that this album is one of the highlights of the early weeks of 2017, and the quality of the music means it may well still be sitting at the top when these next eleven months pass us by. ‘Know Things’ is a dusty opener that comes complete with knocking drums and soulful samples, along with solid turntablism from DJ TMB. From the very start of the album it’s clear that this is an unapologetic throwback to the golden era, but with savage delivery and complex, descriptive imagery, Venomous2000 is a great reminder of why the nineties are as heralded as they are. ‘Sounds Of The Great Ones’ truly is an album every underground head will be racing to hear; the feature-list is remarkable. New Jersey group The Artifacts lace the guaranteed head-nodder ‘Hot Damn’, and upcoming female MC Tiye Phoenix also drops a dope verse here. ‘Homecoming’ features a tasteful piano-based beat and soulful vocals from Marie Kanu. Venomous brings clarity and definition to his vocals, and the precise flow sounds impeccably smooth over Trilian’s dope production. Boston legend Reks and legendary underground spitter C-Rayz Walz appear on the banging ‘Rock The Bells’, and the intricate lyricism from each MC representing on the track make this a prime example of the breed of complex, intelligent writers that have made the east coast such a renowned region for detailed imagery and authentic punchlines. Brooklyn rhymer Shabaam Sahdeeq, along with fellow BK duo Cella Dwellas, feature on the intense ‘Products Of Environment’, and the groovy bassline and layered sample provide a classy backdrop to the selection of heavy-hitters blessing the microphone. Don’t think Venomous2000 can’t hold down a track on his ones though; ‘Marvelous (Planet-Ill)’ is a crunchy, funk-influenced track with a fresh vibe packed with clear hip-hop sensibilities and inventive, creative references, making it a highlight of the ‘Sounds Of The Great Ones’ LP. The star-studded guest appearances are never far away though; Killarmy representative 9th Prince, Wu-Tang MC Inspectah Deck and underground barsmith NLZ join Venomous on the superb ‘Make Ya Speakers Pop’, before the subtle penultimate track ‘Psalms 76’ provides an uptempo end to a really impressive album. Venomous2000 deserves far more acclaim and attention than he receives, and ‘Sounds Of The Great Ones’ exemplifies exactly why. His partnership with Trilian is a wholly successful one, and the cohesive nature of the LP is a testament to their collaborative skills. Get this one in your collection this very instant; you won’t regret it, and that’s a Lytework guarantee.